Simple Receipt Manager is a free app which allows you to keep a track of and manage your receipts on your device. The app has an extremely clean interface which is massively optimized for touch screen devices, and also works great on non touch devices. The app has smooth animations, and large tiles make sure that it is difficult to press any wrong button. 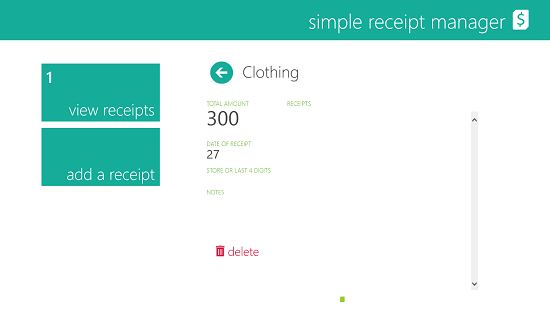 In the app, you can choose to add receipts according to various categories like Travel, Misc, Clothing, etc. To do so all you have to do is to choose the appropriate category while adding the receipt. 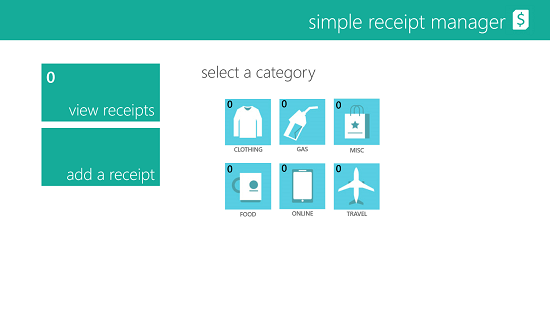 Simple Receipt Manager is available for free from the Windows App Store. When you launch the app, you will be presented with a screen wherein you can access the options to create or view the existing receipts by clicking on the green tiles at the left side of the screen. You will immediately notice how beautiful and clean the interface is. To add a receipt, simply click on the Add a receipt tile at the left side of the screen. You will see a fluid animation which follows, allowing you to add the receipt for your purchases. The first thing that will happen is that you will be asked to choose the category for which you wish to add the receipt. Once you have chosen that and clicked on the arrow button at the bottom right, you will be taken to the screen where you can add the expense amount, add notes and a little description about the same. Once you have entered the required information in the above screen, just press the arrow button at the bottom right again, and now you will be asked if you want to add a picture of the receipt. I didn’t add any picture, and when I saved the receipt, I was taken back to the main screen of the app. You can see that the view receipts button now has a number 1 written alongside it. This means that one receipt has been added to the app. If you take a look at the categories, you can see that the category Clothing has the number 1 next to it, meaning that this is the category in which I added the receipt. When I clicked on the view receipts button, I was taken to the below screen. As you can see, I was clearly able to see all the content that I added related to the receipt. Deleting the receipt was as simple as clicking on the Delete button in the above screen. 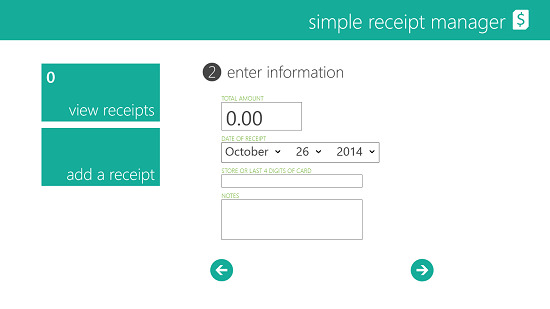 Simple Receipt Manager allows you to easily keep track of the purchases that you make. The app also allows you to add a picture of the receipt, and this way you can be sure that the amount which you have added is extremely accurate. I give this app a 4 out of 5!